We all know how much the new drug, penicillin, has meant to our grievously wounded men on the grim battlefronts of this war -- the countless lives it has saved -- the incalculable suffering which its use has prevented. Science and the great practical genius of this nation made this achievement possible. What we often forget are the millions of pay envelopes on a peacetime Saturday night which are filled because new products and new industries have provided jobs for countless Americans. Science made that possible, too. In 1939 millions of people were employed in industries which did not even exist at the close of the last war -- radio, air conditioning, rayon and other synthetic fibers, and plastics are examples of the products of these industries. But these things do not mark the end of progress -- they are but the beginning if we make full use of our scientific resources. New manufacturing industries can be started and many older industries greatly strengthened and expanded if we continue to study nature's laws and apply new knowledge to practical purposes. Great advances in agriculture are also based upon scientific research. Plants which are more resistant to disease and are adapted to short growing season, the prevention and cure of livestock diseases, the control of our insect enemies, better fertilizers, and improved agricultural practices, all stem from painstaking scientific research. Advances in science when put to practical use mean more jobs, higher wages, shorter hours, more abundant crops, more leisure for recreation, for study, for learning how to live without the deadening drudgery which has been the burden of the common man for ages past. Advances in science will also bring higher standards of living, will lead to the prevention or cure of diseases, will promote conservation of our limited national resources, and will assure means of defense against aggression. But to achieve these objectives -- to secure a high level of employment, to maintain a position of world leadership -- the flow of new scientific knowledge must be both continuous and substantial. Our population increased from 75 million to 130 million between 1900 and 1940. In some countries comparable increases have been accompanied by famine. In this country the increase has been accompanied by more abundant food supply, better living, more leisure, longer life, and better health. This is, largely, the product of three factors -- the free play of initiative of a vigorous people under democracy, the heritage of great national wealth, and the advance of science and its application. It has been basic United States policy that Government should foster the opening of new frontiers. It opened the seas to clipper ships and furnished land for pioneers. Although these frontiers have more or less disappeared, the frontier of science remains. It is in keeping with the American tradition -- one which has made the United States great -- that new frontiers shall be made accessible for development by all American citizens. Moreover, since health, well-being, and security are proper concerns of Government, scientific progress is, and must be, of vital interest to Government. Without scientific progress the national health would deteriorate; without scientific progress we could not hope for improvement in our standard of living or for an increased number of jobs for our citizens; and without scientific progress we could not have maintained our liberties against tyranny. From early days the Government has taken an active interest in scientific matters. During the nineteenth century the Coast and Geodetic Survey, the Naval Observatory, the Department of Agriculture, and the Geological Survey were established. Through the Land Grant College acts the Government has supported research in state institutions for more than 80 years on a gradually increasing scale. Since 1900 a large number of scientific agencies have been established within the Federal Government, until in 1939 they numbered more than 40. Much of the scientific research done by Government agencies is intermediate in character between the two types of work commonly referred to as basic and applied research. Almost all Government scientific work has ultimate practical objectives but, in many fields of broad national concern, it commonly involves long-term investigation of a fundamental nature. Generally speaking, the scientific agencies of Government are not so concerned with immediate practical objectives as are the laboratories of industry nor, on the other hand, are they as free to explore any natural phenomena without regard to possible economic applications as are the educational and private research institutions. Government scientific agencies have splendid records of achievement, but they are limited in function. We have no national policy for science. The Government has only begun to utilize science in the nation's welfare. There is no body within the Government charged with formulating or executing a national science policy. There are no standing committees of the Congress devoted to this important subject. Science has been in the wings. It should be brought to the center of the stage -- for in it lies much of our hope for the future. There are areas of science in which the public interest is acute but which are likely to be cultivated inadequately if left without more support than will come from private sources. These areas -- such as research on military problems, agriculture, housing, public health, certain medical research, and research involving expensive capital facilities beyond the capacity of private institutions -- should be advanced by active Government support. To date, with the exception of the intensive war research conducted by the Office of Scientific Research and Development, such support has been meager and intermittent. For reasons presented in this report we are entering a period when science needs and deserves increased support from public funds. Many of the lessons learned in the war-time application of science under Government can be profitably applied in peace. The Government is peculiarly fitted to perform certain functions, such as the coordination and support of broad programs on problems of great national importance. But we must proceed with caution in carrying over the methods which work in wartime to the very different conditions of peace. We must remove the rigid controls which we have had to impose, and recover freedom of inquiry and that healthy competitive scientific spirit so necessary for expansion of the frontiers of scientific knowledge. Scientific progress on a broad front results from the free play of free intellects, working on subjects of their own choice, in the manner dictated by their curiosity for exploration of the unknown. Freedom of inquiry must be preserved under any plan for Government support of science in accordance with the Five Fundamentals listed on page 26. The study of the momentous questions presented in President Roosevelt's letter has been made by able committees working diligently. This report presents conclusions and recommendations based upon the studies of these committees which appear in full as the appendices. Only in the creation of one over-all mechanism rather than several does this report depart from the specific recommendations of the committees. The members of the committees have reviewed the recommendations in regard to the single mechanism and have found this plan thoroughly acceptable. The death rate for all diseases in the Army, including the overseas forces, has been reduced from 14.1 per thousand in the last war to 0.6 per thousand in this war. Such ravaging diseases as yellow fever, dysentery, typhus, tetanus, pneumonia, and meningitis have been all but conquered by penicillin and the sulfa drugs, the insecticide DDT, better vaccines, and improved hygenic measures. Malaria has been controlled. There has been dramatic progress in surgery. The striking advances in medicine during the war have been possible only because we had a large backlog of scientific data accumulated through basic research in many scientific fields in the years before the war. In the last 40 years life expectancy in the United States has increased from 49 to 65 years largely as a consequence of the reduction in the death rates of infants and children; in the last 20 years the death rate from the diseases of childhood has been reduced 87 percent. Diabetes has been brought under control by insulin, pernicious anemia by liver extracts; and the once widespread deficiency diseases have been much reduced, even in the lowest income groups, by accessory food factors and improvement of diet. Notable advances have been made in the early diagnosis of cancer, and in the surgical and radiation treatment of the disease. These results have been achieved through a great amount of basic research in medicine and the preclinical sciences, and by the dissemination of this new scientific knowledge through the physicians and medical services and public health agencies of the country. In this cooperative endeavour the pharmaceutical industry has played an important role, especially during the war. All of the medical and public health groups share credit for these achievements; they form interdependent members of a team. Progress in combating disease depends upon an expanding body of new scientific knowledge. As President Roosevelt observed, the annual deaths from one or two diseases are far in excess of the total number of American lives lost in battle during this war. A large fraction of these deaths in our civilian population cut short the useful lives of our citizens. This is our present position despite the fact that in the last three decades notable progress has been made in civilian medicine. The reduction in death rate from diseases of childhood has shifted the emphasis to the middle and old age groups, particularly to the malignant diseases and the degenerative processes prominent in later life. Cardiovascular disease, including chronic disease of the kidneys, arteriosclerosis, and cerebral hemorrhage, now account for 45 percent of the deaths in the United States. Second are the infectious diseases, and third is cancer. Added to these are many maladies (for example, the common cold, arthritis, asthma and hay fever, peptic ulcer) which, through infrequently fatal, cause incalculable disability. Another aspect of the changing emphasis is the increase of mental diseases. Approximately 7 million persons in the United States are mentally ill; more than one-third of the hospital beds are occupied by such persons, at a cost of $175 million a year. Each year 125,000 new mental cases are hospitalized. Notwithstanding great progress in prolonging the span of life and relief of suffering, much illness remains for which adequate means of prevention and cure are not yet known. While additional physicians, hospitals, and health programs are needed, their full usefulness cannot be attained unless we enlarge our knowledge of the human organism and the nature of disease. Any extension of medical facilities must be accompanied by an expanded program of medical training and research. Penicillin reached our troops in time to save countless lives because the Government coordinated and supported the program of research and development on the drug. The development moved from the early laboratory stage to large scale production and use in a fraction of the time it would have taken without such leadership. The search for better anti-malarials, which proceeded at a moderate tempo for many years, has been accelerated enormously by Government support during the war. Other examples can be cited in which medical progress has been similarly advanced. In achieving these results, the Government has provided over-all coordination and support; it has not dictated how the work should be done within any cooperating institution. Discovery of new therapeutic agents and methods usually results from basic studies in medicine and the underlying sciences. The development of such materials and methods to the point at which they become available to medical practitioners requires teamwork involving the medical schools, the science departments of universities, Government and the pharmaceutical industry. Government initiative, support, and coordination can be very effective in this development phase. Government initiative and support for the development of newly discovered therapeutic materials and methods can reduce the time required to bring the benefits to the public. The primary place for medical research is in the medical schools and universities. In some cases coordinated direct attack on special problems may be made by teams of investigators, supplementing similar attacks carried on by the Army, Navy, Public Health Service, and other organizations. Apart from teaching, however, the primary obligation of the medical schools and universities is to continue the traditional function of such institutions, namely, to provide the individual worker with an opportunity for free, untrammeled study of nature, in the directions and by the methods suggested by his interests, curiosity, and imagination. The history of medical science teaches clearly the supreme importance of affording the prepared mind complete freedom for the exercise of initiative. It is the special province of the medical schools and universities to foster medical research in this way -- a duty which cannot be shifted to government agencies, industrial organizations, or to any other institutions. Where clinical investigations of the human body are required, the medical schools are in a unique position, because of their close relationship to teaching hospitals, to integrate such investigations with the work of the departments of preclinical science, and to impart new knowledge to physicians in training. At the same time, the teaching hospitals are especially well qualified to carry on medical research because of their close connection with the medical schools, on which they depend for staff and supervision. Between World War I and World War II the United States overtook all other nations in medical research and assumed a position of world leadership. To a considerable extent this progress reflected the liberal financial support from university endowment income, gifts from individuals, and foundation grants in the 20's. The growth of research departments in medical schools ahs been very uneven, however, and in consequence most of the important work has been done in a few large schools. This should be corrected by building up the weaker institutions, especially in regions which now have no strong medical research activities. The traditional sources of support for medical research, largely endowment income, foundation grants, and private donations, are diminishing, and there is no immediate prospect of a change in this trend. Meanwhile, research costs have steadily risen. More elaborate and expensive equipment is required, supplies are more costly, and the wages of assistants are higher. Industry is only to a limited extent a source of funds for basic medical research. It is clear that if we are to maintain the progress in medicine which has marked the last 25 years, the Government should extend financial support to basic medical research in the medical schools and in the universities, through grants both for research and for fellowships. The amount which can be effectively spent in the first year should not exceed 5 million dollars. After a program is under way perhaps 20 million dollars a year can be spent effectively. In this war it has become clear beyond all doubt that scientific research is absolutely essential to national security. The bitter and dangerous battle against the U-boat was a battle of scientific techniques -- and our margin of success was dangerously small. The new eyes which radar supplied to our fighting forces quickly evoked the development of scientific countermeasures which could often blind them. This again represents the ever continuing battle of techniques. The V-1 attack on London was finally defeated by three devices developed during this war and used superbly in the field. V-2 was countered only by the capture of the launching sites. This war emphasizes three facts of supreme importance to national security: (1) Powerful new tactics of defense and offense are developed around new weapons created by scientific and engineering research; (2) the competitive time element in developing those weapons and tactics may be decisive; (3) war is increasingly total war, in which the armed services must be supplemented by active participation of every element of civilian population. To insure continued preparedness along farsighted technical lines, the research scientists of the country must be called upon to continue in peacetime some substantial portion of those types of contribution to national security which they have made so effectively during the stress of the present war * * *. There must be more -- and more adequate -- military research during peacetime. We cannot again rely on our allies to hold off the enemy while we struggle to catch up. Further, it is clear that only the Government can undertake military research; for it must be carried on in secret, much of it has no commercial value, and it is expensive. The obligation of Government to support research on military problems is inescapable. Modern war requires the use of the most advanced scientific techniques. Many of the leaders in the development of radar are scientists who before the war had been exploring the nucleus of the atom. While there must be increased emphasis on science in the future training of officers for both the Army and Navy, such men cannot be expected to be specialists in scientific research. Therefore a professional partnership between the officers in the Services and civilian scientists is needed. The Army and Navy should continue to carry on research and development on the improvement of current weapons. For many years the National Advisory Committee for Aeronautics has supplemented the work of the Army and Navy by conducting basic research on the problems of flight. There should now be permanent civilian activity to supplement the research work of the Services in other scientific fields so as to carry on in time of peace some part of the activities of the emergency war-time Office of Scientific Research and Development. Military preparedness requires a permanent independent, civilian-controlled organization, having close liaison with the Army and Navy, but with funds directly from Congress and with the clear power to initiate military research which will supplement and strengthen that carried on directly under the control of the Army and Navy. One of our hopes is that after the war there will be full employment, and that the production of goods and services will serve to raise our standard of living. We do not know yet how we shall reach that goal, but it is certain that it can be achieved only by releasing the full creative and productive energies of the American people. Surely we will not get there by standing still, merely by making the same things we made before and selling them at the same or higher prices. We will not get ahead in international trade unless we offer new and more attractive and cheaper products. Where will these new products come from? How will we find ways to make better products at lower cost? The answer is clear. There must be a stream of new scientific knowledge to turn the wheels of private and public enterprise. There must be plenty of men and women trained in science and technology for upon them depend both the creation of new knowledge and its application to practical purposes. More and better scientific research is essential to the achievement of our goal of full employment. Basic research is performed without thought of practical ends. It results in general knowledge and an understanding of nature and its laws. This general knowledge provides the means of answering a large number of important practical problems, though it may not give a complete specific answer to any one of them. The function of applied research is to provide such complete answers. The scientist doing basic research may not be at all interested in the practical applications of his work, yet the further progress of industrial development would eventually stagnate if basic scientific research were long neglected. One of the peculiarities of basic science is the variety of paths which lead to productive advance. Many of the most important discoveries have come as a result of experiments undertaken with very different purposes in mind. Statistically it is certain that important and highly useful discoveries will result from some fraction of the undertakings in basic science; but the results of any one particular investigation cannot be predicted with accuracy. Today, it is truer than ever that basic research is the pacemaker of technological progress. In the nineteenth century, Yankee mechanical ingenuity, building largely upon the basic discoveries of European scientists, could greatly advance the technical arts. Now the situation is different. Publicly and privately supported colleges and universities and the endowed research institutes must furnish both the new scientific knowledge and the trained research workers. These institutions are uniquely qualified by tradition and by their special characteristics to carry on basic research. They are charged with the responsibility of conserving the knowledge accumulated by the past, imparting that knowledge to students, and contributing new knowledge of all kinds. It is chiefly in these institutions that scientists may work in an atmosphere which is relatively free from the adverse pressure of convention, prejudice, or commercial necessity. At their best they provide the scientific worker with a strong sense of solidarity and security, as well as a substantial degree of personal intellectual freedom. All of these factors are of great importance in the development of new knowledge, since much of new knowledge is certain to arouse opposition because of its tendency to challenge current beliefs or practice. Industry is generally inhibited by preconceived goals, by its own clearly defined standards, and by the constant pressure of commercial necessity. Satisfactory progress in basic science seldom occurs under conditions prevailing in the normal industrial laboratory. There are some notable exceptions, it is true, but even in such cases it is rarely possible to match the universities in respect to the freedom which is so important to scientific discovery. To serve effectively as the centers of basic research these institutions must be strong and healthy. They must attract our best scientists as teachers and investigators. They must offer research opportunities and sufficient compensation to enable them to compete with industry and government for the cream of scientific talent. Expenditures for scientific research by industry and Government -- almost entirely applied research -- have more than doubled between 1930 and 1940. Whereas in 1930 they were six times as large as the research expenditures of the colleges, universities, and research institutes, by 1940 they were nearly ten times as large. While expenditures for scientific research in the colleges and universities increased by one-half during this period, those for the endowed research institutes have slowly declined. If the colleges, universities, and research institutes are to meet the rapidly increasing demands of industry and Government for new scientific knowledge, their basic research should be strengthened by use of public funds. Although there are some notable exceptions, most research conducted within governmental laboratories is of an applied nature. This has always been true and is likely to remain so. Hence Government, like industry, is dependent on the colleges, universities, and research institutes to expand the basic scientific frontiers and to furnish trained scientific investigators. Research within the Government represents an important part of our total research activity and needs to be strengthened and expanded after the war. Such expansion should be directed to fields of inquiry and service which are of public importance and are not adequately carried on by private organizations. The most important single factor in scientific and technical work is the quality of the personnel employed. The procedures currently followed within the Government for recruiting, classifying and compensating such personnel place the Government under a severe handicap in competing with industry and the universities for first-class scientific talent. Steps should be taken to reduce that handicap. In the Government the arrangement whereby the numerous scientific agencies form parts of larger departments has both advantages and disadvantages. but the present pattern is firmly established and there is much to be said for it. There is, however, a very real need for some measure of coordination of the common scientific activities of these agencies, both as to policies and budgets, and at present no such means exist. This board should be composed of disinterested scientists who have no connection with the affairs of any Government agency. The simplest and most effective way in which the Government can strengthen industrial research is to support basic research and to develop scientific talent. The benefits of basic research do not reach all industries equally or at the same speed. Some small enterprises never receive any of the benefits. It has been suggested that the benefits might be better utilized if "research clinics" for such enterprises were to be established. Businessmen would thus be able to make more use of research than they now do. This proposal is certainly worthy of further study. One of the most important factors affecting the amount of industrial research is the income-tax law. Government action in respect to this subject will affect the rate of technical progress in industry. Uncertainties as to the attitude of the Bureau of Internal Revenue regarding the deduction of research and development expenses are a deterrent to research expenditure. These uncertainties arise from lack of clarity of the tax law as to the proper treatment of such costs. The Internal Revenue Code should be amended to remove present uncertainties in regard to the deductibility of research and development expenditures as current charges against net income. Research is also affected by the patent laws. They stimulate new invention and they make it possible for new industries to be built around new devices or new processes. These industries generate new jobs and new products, all of which contribute to the welfare and the strength of the country. Yet, uncertainties in the operation of the patent laws have impaired the ability of small industries to translate new ideas into processes and products of value to the nation. These uncertainties are, in part, attributable to the difficulties and expense incident to the operation of the patent system as it presently exists. These uncertainties are also attributable to the existence of certain abuses, which have appeared in the use of patents. The abuses should be corrected. They have led to extravagantly critical attacks which tend to discredit a basically sound system. It is important that the patent system continue to serve the country in the manner intended by the Constitution, for it has been a vital element in the industrial vigor which has distinguished this nation. The National Patent Planning Commission has reported on this subject. In addition, a detailed study, with recommendations concerning the extent to which modifications should be made in our patent laws is currently being made under the leadership of the Secretary of Commerce. It is recommended, therefore, that specific action with regard to the patent laws be withheld pending the submission of the report devoted exclusively to that subject. International exchange of scientific information is of growing importance. Increasing specialization of science will make it more important than ever that scientists in this country keep continually ahead of developments abroad. In addition a flow of scientific information constitutes one facet of general international accord which should be cultivated. The Government can accomplish significant results in several ways: by aiding in the arrangement of international science congresses, in the official accrediting of American scientists to such gatherings, in the official reception of foreign scientists of standing in this country, in making possible a rapid flow of technical information, including translation service, and possibly in the provision of international fellowships. Private foundations and other groups partially fulfill some of these functions at present, but their scope is incomplete and inadequate. The Government should take an active role in promoting the international flow of scientific information. We can no longer count on ravaged Europe as a source of fundamental knowledge. In the past we have devoted much of our best efforts to the application of such knowledge which has been discovered abroad. In the future we must pay increased attention to discovering this knowledge for ourselves particularly since the scientific applications of the future will be more than ever dependent upon such basic knowledge. New impetus must be given to research in our country. Such impetus can come promptly only from the Government. Expenditures for research in the colleges, universities, and research institutes will otherwise not be able to meet the additional demands of increased public need for research. Further, we cannot expect industry adequately to fill the gap. Industry will fully rise to the challenge of applying new knowledge to new products. The commercial incentive can be relied upon for that. But basic research is essentially noncommercial in nature. It will not receive the attention it requires if left to industry. For many years the Government has wisely supported research in the agricultural colleges and the benefits have been great. The time has come when such support should be extended to other fields. In providing government support, however, we must endeavor to preserve as far as possible the private support of research both in industry and in the colleges, universities, and research institutes. These private sources should continue to carry their share of the financial burden. It is estimated that an adequate program for Federal support of basic research in the colleges, universities, and research institutes and for financing important applied research in the public interest, will cost about 10 million dollars at the outset and may rise to about 50 million dollars annually when fully underway at the end of perhaps 5 years. "* * * in every section of the entire area where the word science may properly be applied, the limiting factor is a human one. We shall have rapid or slow advance in this direction or in that depending on the number of really first-class men who are engaged in the work in question. * * * So in the last analysis, the future of science in this country will be determined by our basic educational policy." "As citizens, as good citizens, we therefore think that we must have in mind while examining the question before us -- the discovery and development of scientific talent -- the needs of the whole national welfare. We could not suggest to you a program which would syphon into science and technology a disproportionately large share of the nation's highest abilities, without doing harm to the nation, nor, indeed, without crippling science. * * * Science cannot live by and unto itself alone." "The uses to which high ability in youth can be put are various and, to a large extent, are determined by social pressures and rewards. When aided by selective devices for picking out scientifically talented youth, it is clear that large sums of money for scholarships and fellowships and monetary and other rewards in disproportionate amounts might draw into science too large a percentage of the nation's high ability, with a result highly detrimental to the nation and to science. Plans for the discovery and development of scientific talent must be related to the other needs of society for high ability. * * * There is never enough ability at high levels to satisfy all the needs of the nation; we would not seek to draw into science any more of it than science's proportionate share." Among the young men and women qualified to take up scientific work, since 1940 there have been few students over 18, except some in medicine and engineering in Army and Navy programs and a few 4-F's, who have followed an integrated scientific course of studies. Neither our allies nor, so far as we know, our enemies have done anything so radical as thus to suspend almost completely their educational activities in scientific pursuits during the war period. Two great principles have guided us in this country as we have turned our full efforts to war. First, the sound democratic principle that there should be no favored classes or special privilege in a time of peril, that all should be ready to sacrifice equally; second, the tenet that every man should serve in the capacity in which his talents and experience can best be applied for the prosecution of the war effort. In general we have held these principles well in balance. In my opinion, however, we have drawn too heavily for nonscientific purposes upon the great natural resource which resides in our trained young scientists and engineers. For the general good of the country too many such men have gone into uniform, and their talents have not always been fully utilized. With the exception of those men engaged in war research, all physically fit students at graduate level have been taken into the armed forces. Those ready for college training in the sciences have not been permitted to enter upon that training. There is thus an accumulating deficit of trained research personnel which will continue for many years. The deficit of science and technology students who, but for the war, would have received bachelor's degrees is about 150,000. The deficit of those holding advanced degrees -- that is, young scholars trained to the point where they are capable of carrying on original work -- has been estimated as amounting to about 17,000 by 1955 in chemistry, engineering, geology, mathematics, physics, psychology, and the biological sciences. With mounting demands for scientists both for teaching and for research, we will enter the post-war period with a serious deficit in our trained scientific personnel. "If we were all-knowing and all-wise we might, but we think probably not, write you a plan whereby there might be selected for training, which they otherwise would not get, those who, 20 years hence, would be scientific leaders, and we might not bother about any lesser manifestations of scientific ability. But in the present state of knowledge a plan cannot be made which will select, and assist, only those young men and women who will give the top future leadership to science. To get top leadership there must be a relatively large base of high ability selected for development and then successive skimmings of the cream of ability at successive times and at higher levels. No one can select from the bottom those who will be the leaders at the top because unmeasured and unknown factors enter into scientific, or any, leadership. There are brains and character, strength and health, happiness and spiritual vitality, interest and motivation, and no one knows what else, that must needs enter into this supra-mathematical calculus. "We think we probably would not, even if we were all-wise and all-knowing, write you a plan whereby you would be assured of scientific leadership at one stroke. We think as we think because we are not interested in setting up an elect. We think it much the best plan, in this constitutional Republic, that opportunity be held out to all kinds and conditions of men whereby they can better themselves. This is the American way; this is the way the United States has become what it is. We think it very important that circumstances be such that there be no ceilings, other than ability itself, to intellectual ambition. We think it very important that every boy and girl shall know that, if he shows that he has what it takes, the sky is the limit. Even if it be shown subsequently that he has not what it takes to go to the top, he will go further than he would otherwise go if there had been a ceiling beyond which he always knew he could not aspire. "By proceeding from point to point and taking stock on the way, by giving further opportunity to those who show themselves worthy of further opportunity, by giving the most opportunity to those who show themselves continually developing -- this is the way we propose. This is the American way: a man works for what he gets." Higher education in this country is largely for those who have the means. If those who have the means coincided entirely with those persons who have the talent we should not be squandering a part of our higher education on those undeserving of it, nor neglecting great talent among those who fail to attend college for economic reasons. There are talented individuals in every segment of the population, but with few exceptions those without the means of buying higher education go without it. Here is a tremendous waste of the greatest resource of a nation -- the intelligence of its citizens. We have a serious deficit in scientific personnel partly because the men who would have studied science in the colleges and universities have been serving in the Armed Forces. Many had begun their studies before they went to war. Others with capacity for scientific education went to war after finishing high school. The most immediate prospect of making up some of the deficit in scientific personnel is by salvaging scientific talent from the generation in uniform. For even if we should start now to train the current crop of high school graduates, it would be 1951 before they would complete graduate studies and be prepared for effective scientific research. This fact underlines the necessity of salvaging potential scientists in uniform. The Armed Services should comb their records for men who, prior to or during the war, have given evidence of talent for science, and make prompt arrangements, consistent with current discharge plans, for ordering those who remain in uniform as soon as militarily possible to duty at institutions here and overseas where they can continue their scientific education. Moreover, they should see that those who study overseas have the benefit of the latest scientific developments. The country may be proud of the fact that 95 percent of boys and girls of the fifth grade age are enrolled in school, but the drop in enrollment after the fifth grade is less satisfying. For every 1,000 students in the fifth grade, 600 are lost to education before the end of high school, and all but 72 have ceased formal education before completion of college. While we are concerned primarily with methods of selecting and educating high school graduates at the college and higher levels, we cannot be complacent about the loss of potential talent which is inherent in the present situation. Students drop out of school, college, and graduate school, or do not get that far, for a variety of reasons: they cannot afford to go on; schools and colleges providing courses equal to their capacity are not available locally; business and industry recruit many of the most promising before they have finished the training of which they are capable. These reasons apply with particular force to science: the road is long and expensive; it extends at least 6 years beyond high school; the percentage of science students who can obtain first-rate training in institutions near home is small. Improvement in the teaching of science is imperative; for students of latent scientific ability are particularly vulnerable to high school teaching which fails to awaken interest or to provide adequate instruction. To enlarge the group of specially qualified men and women it is necessary to increase the number who go to college. This involves improved high school instruction, provision for helping individual talented students to finish high school (primarily the responsibility of the local communities), and opportunities for more capable, promising high school students to go to college. Anything short of this means serious waste of higher education and neglect of human resources. To encourage and enable a larger number of young men and women of ability to take up science as a career, and in order gradually to reduce the deficit of trained scientific personnel, it is recommended that provision be made for a reasonable number of (a) undergraduate scholarships and graduate fellowships and (b) fellowships for advanced training and fundamental research. The details should be worked out with reference to the interests of the several States and of the universities and colleges; and care should be taken not to impair the freedom of the institutions and individuals concerned. The program proposed by the Moe Committee in Appendix 4 would provide 24,000 undergraduate scholarships and 900 graduate fellowships and would cost about $30,000,000 annually when in full operation. Each year under this program 6,000 undergraduate scholarships would be made available to high school graduates, and 300 graduate fellowships would be offered to college graduates. Approximately the scale of allowances provided for under the educational program for returning veterans has been used in estimating the cost of this program. The plan is, further, that all those who receive such scholarships or fellowships in science should be enrolled in a National Science Reserve and be liable to call into the service of the Government, in connection with scientific or technical work in time of war or other national emergency declared by Congress or proclaimed by the President. Thus, in addition to the general benefits to the nation by reason of the addition to its trained ranks of such a corps of scientific workers, there would be a definite benefit to the nation in having these scientific workers on call in national emergencies. The Government would be well advised to invest the money involved in this plan even if the benefits to the nation were thought of solely -- which they are not -- in terms of national preparedness. We have been living on our fat. For more than 5 years many of our scientists have been fighting the war in the laboratories, in the factories and shops, and at the front. We have been directing the energies of our scientists to the development of weapons and materials and methods, on a large number of relatively narrow projects initiated and controlled by the Office of Scientific Research and Development and other Government agencies. Like troops, the scientists have been mobilized, and thrown into action to serve their country in time of emergency. But they have been diverted to a greater extent than is generally appreciated from the search for answers to the fundamental problems -- from the search on which human welfare and progress depends. This is not a complaint -- it is a fact. The mobilization of science behind the lines is aiding the fighting men at the front to win the war and to shorten it; and it has resulted incidentally in the accumulation of a vast amount of experience and knowledge of the application of science to particular problems, much of which can be put to use when the war is over. Fortunately, this country had the scientists -- and the time -- to make this contribution and thus to advance the date of victory. Much of the information and experience acquired during the war is confined to the agencies that gathered it. Except to the extent that military security dictates otherwise, such knowledge should be spread upon the record for the benefit of the general public. Thanks to the wise provision of the Secretary of War and the Secretary of the Navy, most of the results of war-time medical research have been published. Several hundred articles have appeared in the professional journals; many are in process of publication. The material still subject to security classification should be released as soon as possible. It is my view that most of the remainder of the classified scientific material should be released as soon as there is ground for belief that the enemy will not be able to turn it against us in this war. Most of the information needed by industry and in education can be released without disclosing its embodiments in actual military material and devices. Basically there is no reason to believe that scientists of other countries will not in time rediscover everything we now know which is held in secrecy. A broad dissemination of scientific information upon which further advances can readily be made furnishes a sounder foundation for our national security than a policy of restriction which would impede our own progress although imposed in the hope that possible enemies would not catch up with us. During the war it has been necessary for selected groups of scientists to work on specialized problems, with relatively little information as to what other groups were doing and had done. Working against time, the Office of Scientific Research and Development has been obliged to enforce this practice during the war, although it was realized by all concerned that it was an emergency measure which prevented the continuous cross-fertilization so essential to fruitful scientific effort. Our ability to overcome possible future enemies depends upon scientific advances which will proceed more rapidly with diffusion of knowledge than under a policy of continued restriction of knowledge now in our possession. In planning the release of scientific data and experience collected in connection with the war, we must not overlook the fact that research has gone forward under many auspices -- the Army, the Navy, the Office of Scientific Research and Development, the National Advisory Committee for Aeronautics, other departments and agencies of the Government, educational institutions, and many industrial organizations. There have been numerous cases of independent discovery of the same truth in different places. To permit the release of information by one agency and to continue to restrict it elsewhere would be unfair in its effect and would tend to impair the morale and efficiency of scientists who have submerged individual interests in the controls and restrictions of war. A part of the information now classified which should be released is possessed jointly by our allies and ourselves. Plans for release of such information should be coordinated with our allies to minimize danger of international friction which would result from sporadic uncontrolled release. The agency responsible for recommending the release of information from military classification should be an Army, Navy, civilian body, well grounded in science and technology. It should be competent to advise the Secretary of War and the Secretary of the Navy. It should, moreover, have sufficient recognition to secure prompt and practical decisions. To satisfy these considerations I recommend the establishment of a Board, made up equally of scientists and military men, whose function would be to pass upon the declassification and to control the release for publication of scientific information which is now classified. The release of information from security regulations is but one phase of the problem. The other is to provide for preparation of the material and its publication in a form and at a price which will facilitate dissemination and use. In the case of the Office of Scientific Research and Development, arrangements have been made for the preparation of manuscripts, while the staffs under our control are still assembled and in possession of the records, as soon as the pressure for production of results for this war has begun to relax. We should get this scientific material to scientists everywhere with great promptness, and at as low a price as is consistent with suitable format. We should also get it to the men studying overseas so that they will know what has happened in their absence. It is recommended that measures which will encourage and facilitate the preparation and publication of reports be adopted forthwith by all agencies, governmental and private, possessing scientific information released from security control. One lesson is clear from the reports of the several committees attached as appendices. The Federal Government should accept new responsibilities for promoting the creation of new scientific knowledge and the development of scientific talent in our youth. The extent and nature of these new responsibilities are set forth in detail in the reports of the committees whose recommendations in this regard are fully endorsed. In discharging these responsibilities Federal funds should be made available. We have given much thought to the question of how plans for the use of Federal funds may be arranged so that such funds will not drive out of the picture funds from local governments, foundations, and private donors. We believe that our proposals will minimize that effect, but we do not think that it can be completely avoided. We submit, however, that the nation's need for more and better scientific research is such that the risk must be accepted. It is also clear that the effective discharge of these responsibilities will require the full attention of some over-all agency devoted to that purpose. There should be a focal point within the Government for a concerted program of assisting scientific research conducted outside of Government. Such an agency should furnish the funds needed to support basic research in the colleges and universities, should coordinate where possible research programs on matters of utmost importance to the national welfare, should formulate a national policy for the Government toward science, should sponsor the interchange of scientific information among scientists and laboratories both in this country and abroad, and should ensure that the incentives to research in industry and the universities are maintained. All of the committees advising on these matters agree on the necessity for such an agency. There are within Government departments many groups whose interests are primarily those of scientific research. Notable examples are found within the Departments of Agriculture, Commerce, Interior, and the Federal Security Agency. These groups are concerned with science as collateral and peripheral to the major problems of those Departments. These groups should remain where they are, and continue to perform their present functions, including the support of agricultural research by grants to the Land Grant Colleges and Experiment Stations, since their largest contribution lies in applying fundamental knowledge to the special problems of the Departments within which they are established. By the same token these groups cannot be made the repository of the new and large responsibilities in science which belong to the Government and which the Government should accept. The recommendations in this report which relate to research within the Government, to the release of scientific information, to clarification of the tax laws, and to the recovery and development of our scientific talent now in uniform can be implemented by action within the existing structure of the Government. But nowhere in the Governmental structure receiving its funds from Congress is there an agency adapted to supplementing the support of basic research in the universities, both in medicine and the natural sciences; adapted to supporting research on new weapons for both Services; or adapted to administering a program of science scholarships and fellowships. A new agency should be established, therefore, by the Congress for the purpose. Such an agency, moreover, should be an independent agency devoted to the support of scientific research and advanced scientific education alone. Industry learned many years ago that basic research cannot often be fruitfully conducted as an adjunct to or a subdivision of an operating agency or department. Operating agencies have immediate operating goals and are under constant pressure to produce in a tangible way, for that is the test of their value. None of these conditions is favorable to basic research. research is the exploration of the unknown and is necessarily speculative. It is inhibited by conventional approaches, traditions, and standards. It cannot be satisfactorily conducted in an atmosphere where it is gauged and tested by operating or production standards. Basic scientific research should not, therefore, be placed under an operating agency whose paramount concern is anything other than research. Research will always suffer when put in competition with operations. The decision that there should be a new and independent agency was reached by each of the committees advising in these matters. I am convinced that these new functions should be centered in one agency. Science is fundamentally a unitary thing. The number of independent agencies should be kept to a minimum. Much medical progress, for example, will come from fundamental advances in chemistry. Separation of the sciences in tight compartments, as would occur if more than one agency were involved, would retard and not advance scientific knowledge as a whole. (1) Whatever the extent of support may be, there must be stability of funds over a period of years so that long-range programs may be undertaken. (2) The agency to administer such funds should be composed of citizens selected only on the basis of their interest in and capacity to promote the work of the agency. They should be persons of broad interest in and understanding of the peculiarities of scientific research and education. (3) The agency should promote research through contracts or grants to organizations outside the Federal Government. It should not operate any laboratories of its own. (4) Support of basic research in the public and private colleges, universities, and research institutes must leave the internal control of policy, personnel, and the method and scope of the research to the institutions themselves. This is of the utmost importance. (5) While assuring complete independence and freedom for the nature, scope, and methodology of research carried on in the institutions receiving public funds, and while retaining discretion in the allocation of funds among such institutions, the Foundation proposed herein must be responsible to the President and the Congress. Only through such responsibility can we maintain the proper relationship between science and other aspects of a democratic system. The usual controls of audits, reports, budgeting, and the like, should, of course, apply to the administrative and fiscal operations of the Foundation, subject, however, to such adjustments in procedure as are necessary to meet the special requirements of research. Basic research is a long-term process -- it ceases to be basic if immediate results are expected on short-term support. Methods should therefore be found which will permit the agency to make commitments of funds from current appropriations for programs of five years duration or longer. Continuity and stability of the program and its support may be expected (a) from the growing realization by the Congress of the benefits to the public from scientific research, and (b) from the conviction which will grow among those who conduct research under the auspices of the agency that good quality work will be followed by continuing support. As stated earlier in this report, military preparedness requires a permanent, independent, civilian-controlled organization, having close liaison with the Army and Navy, but with funds direct from Congress and the clear power to initiate military research which will supplement and strengthen that carried on directly under the control of the Army and Navy. As a temporary measure the National Academy of Sciences has established the Research Board for National Security at the request of the Secretary of War and the Secretary of the Navy. This is highly desirable in order that there may be no interruption in the relations between scientists and military men after the emergency wartime Office of Scientific Research and Development goes out of existence. The Congress is now considering legislation to provide funds for this Board by direct appropriation. I believe that, as a permanent measure, it would be appropriate to add to the agency needed to perform the other functions recommended in this report the responsibilities for civilian-initiated and civilian-controlled military research. The function of such a civilian group would be primarily to conduct long-range scientific research on military problems - leaving to the Services research on the improvement of existing weapons. Some research on military problems should be conducted, in time of peace as well as in war, by civilians independently of the military establishment. It is the primary responsibility of the Army and Navy to train the men, make available the weapons, and employ the strategy that will bring victory in combat. The Armed Services cannot be expected to be experts in all of the complicated fields which make it possible for a great nation to fight successfully in total war. There are certain kinds of research - such as research on the improvement of existing weapons -- which can best be done within the military establishment. However, the job of long-range research involving application of the newest scientific discoveries to military needs should be the responsibility of those civilian scientists in the universities and in industry who are best trained to discharge it thoroughly and successfully. It is essential that both kinds of research go forward and that there be the closest liaison between the two groups. Placing the civilian military research function in the proposed agency would bring it into close relationship with a broad program of basic research in both the natural sciences and medicine. A balance between military and other research could thus readily be maintained. The establishment of the new agency, including a civilian military research group, should not be delayed by the existence of the Research Board for National Security, which is a temporary measure. Nor should the creation of the new agency be delayed by uncertainties in regard to the postwar organization of our military departments themselves. Clearly, the new agency, including a civilian military research group within it, can remain sufficiently flexible to adapt its operations to whatever may be the final organization of the military departments. It is my judgment that the national interest in scientific research and scientific education can best be promoted by the creation of a National Research Foundation. I. Purposes. - The National Research Foundation should develop and promote a national policy for scientific research and scientific education, should support basic research in nonprofit organizations, should develop scientific talent in American youth by means of scholarships and fellowships, and should by contract and otherwise support long-range research on military matters. II. Members. - 1. Responsibility to the people, through the President and Congress, should be placed in the hands of, say nine Members, who should be persons not otherwise connected with the Government and not representative of any special interest, who should be known as National Research Foundation Members, selected by the President on the basis of their interest in and capacity to promote the purposes of the Foundation. 2. The terms of the Members should be, say, 4 years, and no Member should be eligible for immediate reappointment provided he has served a full 4-year term. It should be arranged that the Members first appointed serve terms of such length that at least two Members are appointed each succeeding year. 3. The Members should serve without compensation but should be entitled to their expenses incurred in the performance of their duties. 4. The Members should elect their own chairman annually. 5. The chief executive officer of the Foundation should be a director appointed by the Members. Subject to the direction and supervision of the Foundation Members (acting as a board), the director should discharge all the fiscal, legal, and administrative functions of the Foundation. The director should receive a salary that is fully adequate to attract an outstanding man to the post. 6. There should be an administrative office responsible to the director to handle in one place the fiscal, legal, personnel, and other similar administrative functions necessary to the accomplishment of the purposes of the Foundation. 7. With the exception of the director, the division members, and one executive officer appointed by the director to administer the affairs of each division, all employees of the Foundation should be appointed under Civil Service regulations. Division of Medical Research. - The function of this Division should be to support medical research. Division of Natural Sciences. - The function of this Division should be to support research in the physical and natural sciences. Division of National Defense. - It should be the function of this Division to support long-range scientific research on military matters. Division of Scientific Personnel and Education. - It should be the function of this Division to support and to supervise the grant of scholarships and fellowships in science. Division of Publications and Scientific Collaboration. - This Division should be charged with encouraging the publication of scientific knowledge and promoting international exchange of scientific information. 2. Each Division of the Foundation should be made up of at least five members, appointed by the Members of the Foundation. In making such appointments the Members should request and consider recommendations from the National Academy of Sciences which should be asked to establish a new National Research Foundation nominating committee in order to bring together the recommendations of scientists in all organizations. The chairman of each Division should be appointed by the Members of the Foundation. 3. The division Members should be appointed for such terms as the Members of the Foundation may determine, and may be reappointed at the discretion of the Members. They should receive their expenses and compensation for their services at a per diem rate of, say, $50 while engaged on business of the Foundation, but no division member should receive more than, say, $10,000 compensation per year. 4. Membership of the Division of National Defense should include, in addition to, say, five civilian members, one representative designated by the Secretary of War, and one representative of the Secretary of the Navy, who should serve without additional compensation for this duty. To formulate over-all policies of the Foundation. To establish and maintain such offices within the United States, its territories and possessions, as they may deem necessary. To meet and function at any place within the United States, its territories and possessions. To obtain and utilize the services of other Government agencies to the extent that such agencies are prepared to render such services. To adopt, promulgate, amend, and rescind rules and regulations to carry out the provisions of the legislation and the policies and practices of the Foundation. To review and balance the financial requirements of the several Divisions and to propose to the President the annual estimate for the funds required by each Division. Appropriations should be earmarked for the purposes of specific Divisions, but the Foundation should be left discretion with respect to the expenditure of each Division's funds. To make contracts or grants for the conduct of research by negotiation without advertising for bids. To create such advisory and cooperating agencies and councils, state, regional, or national, as in their judgment will aid in effectuating the purposes of the legislation, and to pay the expenses thereof. To enter into contracts with or make grants to educational and nonprofit research institutions for support of scientific research. To initiate and finance in appropriate agencies, institutions, or organizations, research on problems related to the national defense. To initiate and finance in appropriate organizations research projects for which existing facilities are unavailable or inadequate. To establish scholarships and fellowships in the natural sciences including biology and medicine. To promote the dissemination of scientific and technical information and to further its international exchange. To support international cooperation in science by providing financial aid for international meetings, associations of scientific societies, and scientific research programs organized on an international basis. To devise and promote the use of methods of improving the transition between research and its practical application in industry. Formulation of programs and policy within the scope of the particular Divisions. Recommendations regarding the allocation of research programs among research organizations. Recommendation of appropriate arrangements between the Foundation and the organizations selected to carry on the program. Recommendation of arrangements with State and local authorities in regard to cooperation in a program of science scholarships and fellowships. Periodic review of the quality of research being conducted under the auspices of the particular Division and revision of the program of support of research. Presentation of budgets of financial needs for the work of the Division. Maintaining liaison with other scientific research agencies, both governmental and private, concerned with the work of the Division. V. Patent Policy. - The success of the National Research Foundation in promoting scientific research in this country will depend to a very large degree upon the cooperation of organizations outside the Government. In making contracts with or grants to such organizations the Foundation should protect the public interest adequately and at the same time leave the cooperating organization with adequate freedom and incentive to conduct scientific research. The public interest will normally be adequately protected if the Government receives a royalty-free license for governmental purposes under any patents resulting from work financed by the Foundation. There should be no obligation on the research institution to patent discoveries made as a result of support from the Foundation. There should certainly not be any absolute requirement that all rights in such discoveries be assigned to the Government, but it should be left to the discretion of the director and the interested Division whether in special cases the public interest requires such an assignment. Legislation on this point should leave to the Members of the Foundation discretion as to its patent policy in order that patent arrangements may be adjusted as circumstances and the public interest require. VI. Special Authority. - In order to insure that men of great competence and experience may be designated as Members of the Foundation and as members of the several professional Divisions, the legislation creating the Foundation should contain specific authorization so that the Members of the Foundation and the Members of the Divisions may also engage in private and gainful employment, notwithstanding the provisions of any other laws: provided, however, that no compensation for such employment is received in any form from any profit-making institution which receives funds under contract, or otherwise, from the Division or Divisions of the Foundation with which the individual is concerned. In normal times, in view of the restrictive statutory prohibitions against dual interests on the part of Government officials, it would be virtually impossible to persuade persons having private employment of any kind to serve the Government in an official capacity. In order, however, to secure the part-time services of the most competent men as Members of the Foundation and the Divisions, these stringent prohibitions should be relaxed to the extent indicated. Since research is unlike the procurement of standardized items, which are susceptible to competitive bidding on fixed specifications, the legislation creating the National Research Foundation should free the Foundation from the obligation to place its contracts for research through advertising for bids. This is particularly so since the measure of a successful research contract lies not in the dollar cost but in the qualitative and quantitative contribution which is made to our knowledge. The extent of this contribution in turn depends on the creative spirit and talent which can be brought to bear within a research laboratory. The National Research Foundation must, therefore, be free to place its research contracts or grants not only with those institutions which have a demonstrated research capacity but also with other institutions whose latent talent or creative atmosphere affords promise of research success. As in the case of the research sponsored during the war by the Office of Scientific Research and Development, the research sponsored by the National Research Foundation should be conducted, in general, on an actual cost basis without profit to the institution receiving the research contract or grant. There is one other matter which requires special mention. Since research does not fall within the category of normal commercial or procurement operations which are easily covered by the usual contractual relations, it is essential that certain statutory and regulatory fiscal requirements be waived in the case of research contractors. For example, the National Research Foundation should be authorized by legislation to make, modify, or amend contracts of all kinds with or without legal consideration, and without performance bonds. Similarly, advance payments should be allowed in the discretion of the Director of the Foundation when required. Finally, the normal vouchering requirements of the General Accounting Office with respect to detailed itemization or substantiation of vouchers submitted under cost contracts should be relaxed for research contractors. Adherence to the usual procedures in the case of research contracts will impair the efficiency of research operations and will needlessly increase the cost of the work of the Government. Without the broad authority along these lines which was contained in the First War Powers Act and its implementing Executive Orders, together with the special relaxation of vouchering requirements granted by the General Accounting Office, the Office of Scientific Research and Development would have been gravely handicapped in carrying on research on military matters during this war. Colleges and universities in which research will be conducted principally under contract with the Foundation are, unlike commercial institutions, not equipped to handle the detailed vouchering procedures and auditing technicalities which are required of the usual Government contractors. The National Research Foundation herein proposed meets the urgent need of the days ahead. The form of the organization suggested is the result of considerable deliberation. The form is important. 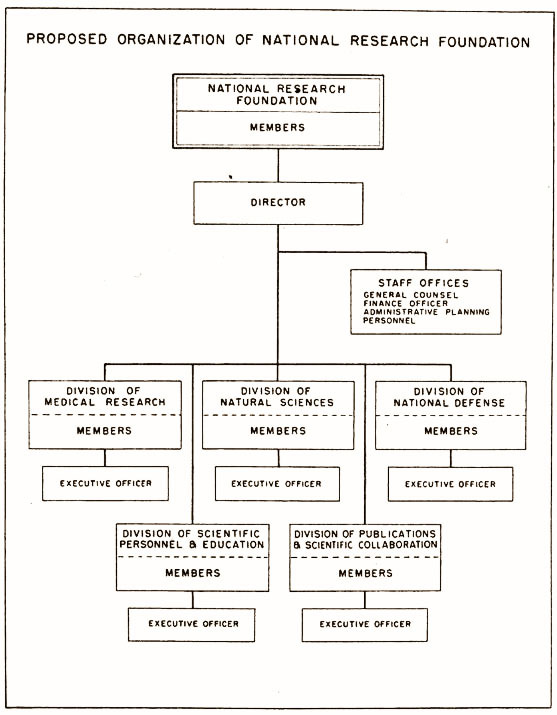 The very successful pattern of organization of the National Advisory Committee for Aeronautics, which has promoted basic research on problems of flight during the past thirty years, has been carefully considered in proposing the method of appointment of Members of the Foundation and in defining their responsibilities. Moreover, whatever program is established it is vitally important that it satisfy the Five Fundamentals. The Foundation here proposed has been described only in outline. The excellent reports of the committees which studied these matters are attached as appendices. They will be of aid in furnishing detailed suggestions. Legislation is necessary. It should be drafted with great care. Early action is imperative, however, if this nation is to meet the challenge of science and fully utilize the potentialities of science. On the wisdom with which we bring science to bear against the problems of the coming years depends in large measure our future as a nation.